At the beginning of 2001, the Enron Corporation, the world's dominant energy trader, appeared unstoppable. The company's decade-long effort to persuade lawmakers to deregulate electricity markets had succeeded from California to New York. Its ties to the Bush administration assured that its views would be heard in Washington. Its sales, profits and stock were soaring. —A. Berenson and R. A. Oppel, Jr. The New York Times, Oct 28, 2001. —Kenneth Lay answering an analyst's question on August 14, 2001. Something is rotten with the state of Enron. —The New York Times, Sept 9, 2001. In its accounting work for Enron, Andersen had been sloppy and weak. But that's how Enron had always wanted it. In truth, even as they angrily pointed fingers, the two deserved each other. —Bethany McLean and Peter Elkind in The Smartest Guys in the Room. ^ a b c Benston, George J. (November 6, 2003). "The Quality of Corporate Financial Statements and Their Auditors Before and After Enron" (PDF). Policy Analysis. Washington D.C.: Cato Institute (497): 12. Archived from the original (PDF) on October 18, 2010. Retrieved 2010-10-17. ^ a b Ayala, Astrid; Giancarlo Ibárgüen, Snr (March 2006). "A Market Proposal for Auditing the Financial Statements of Public Companies" (PDF). Journal of Management of Value. Universidad Francisco Marroquín: 1. Archived from the original (PDF) on October 18, 2010. Retrieved 2010-10-17. ^ Healy, Paul M.; Krishna G. Palepu (Spring 2003). "The Fall of Enron" (PDF). Journal of Economic Perspectives. 17 (2): 3. doi:10.1257/089533003765888403. Archived from the original (PDF) on October 18, 2010. Retrieved 2010-10-17. ^ a b Gerth, Jeff; Richard A. Oppel, Jr. (November 10, 2001). "Regulators struggle with a marketplace created by Enron". The New York Times. Archived from the original on October 18, 2010. Retrieved 2010-10-17. ^ a b Banerjee, Neela (November 9, 2001). "Surest steps, not the swiftest, are propelling Dynegy past Enron". The New York Times. Archived from the original on October 18, 2010. Retrieved 2010-10-17. ^ Healy, Paul M.; Krishna G. Palepu (Spring 2003). "The Fall of Enron" (PDF). Journal of Economic Perspectives. 17 (2): 7. doi:10.1257/089533003765888403. Archived from the original (PDF) on October 18, 2010. Retrieved 2010-10-17. ^ Healy, Paul M.; Krishna G. Palepu (Spring 2003). "The Fall of Enron" (PDF). Journal of Economic Perspectives. 17 (2): 5. doi:10.1257/089533003765888403. Archived from the original (PDF) on October 18, 2010. Retrieved 2010-10-17. ^ a b Healy, Paul M.; Krishna G. Palepu (Spring 2003). "The Fall of Enron" (PDF). Journal of Economic Perspectives. 17 (2): 1. doi:10.1257/089533003765888403. Archived from the original (PDF) on October 18, 2010. Retrieved 2010-10-17. ^ Mack, Toni (October 14, 2002). "The Other Enron Story". Forbes. Archived from the original on October 18, 2010. Retrieved 2010-10-17. ^ Healy, Paul M.; Krishna G. Palepu (Spring 2003). "The Fall of Enron" (PDF). Journal of Economic Perspectives. 17 (2): 9. doi:10.1257/089533003765888403. Archived from the original (PDF) on October 18, 2010. Retrieved 2010-10-17. ^ Foss, Michelle Michot (September 2003). "Enron and the Energy Market Revolution" (PDF). University of Houston Law Center: 1. Archived from the original (PDF) on October 18, 2010. Retrieved 2010-10-17. ^ Dharan, Bala G.; William R. Bufkins (July 2008). "Red Flags in Enron's Reporting of Revenues and Key Financial Measures" (PDF). Social Science Research Network: 101–103. Archived from the original (PDF) on October 18, 2010. Retrieved 2010-10-17. ^ Dharan, Bala G.; William R. Bufkins (July 2008). "Red Flags in Enron's Reporting of Revenues and Key Financial Measures" (PDF). Social Science Research Network: 102. Archived from the original (PDF) on October 18, 2010. Retrieved 2010-10-17. ^ Dharan, Bala G.; William R. Bufkins (July 2008). "Red Flags in Enron's Reporting of Revenues and Key Financial Measures" (PDF). Social Science Research Network: 105. Archived from the original (PDF) on October 18, 2010. Retrieved 2010-10-17. ^ Dharan, Bala G.; William R. Bufkins (July 2008). "Red Flags in Enron's Reporting of Revenues and Key Financial Measures" (PDF). Social Science Research Network: 97–100. Archived from the original (PDF) on October 18, 2010. Retrieved 2010-10-17. ^ a b Mack, Toni (May 24, 1993). "Hidden Risks". Forbes. Retrieved 2010-10-16. (Registration required (help)). ^ a b c Healy, Paul M.; Krishna G. Palepu (Spring 2003). "The Fall of Enron" (PDF). Journal of Economic Perspectives. 17 (2): 10. doi:10.1257/089533003765888403. Archived from the original (PDF) on October 18, 2010. Retrieved 2010-10-17. ^ Hays, Kristen (April 17, 2005). "Next Enron trial focuses on broadband unit". USA Today. Archived from the original on October 18, 2010. Retrieved 2010-10-17. ^ a b c d e Healy, Paul M.; Krishna G. Palepu (Spring 2003). "The Fall of Enron" (PDF). Journal of Economic Perspectives. 17 (2): 11. doi:10.1257/089533003765888403. Archived from the original (PDF) on October 18, 2010. Retrieved 2010-10-17. ^ McCullough, Robert (January 2002). "Understanding Whitewing" (PDF). Portland, Oregon: McCullough Research: 1. Archived from the original (PDF) on October 18, 2010. Retrieved 2010-10-17. ^ Cornford, Andrew (June 2004). "Internationally Agreed Principles For Corporate Governance And The Enron Case" (PDF). G-24 Discussion Paper Series No. 30. New York: United Nations Conference on Trade and Development: 18. Archived from the original (PDF) on October 18, 2010. Retrieved 2010-10-17. ^ Levine, Greg (March 7, 2006). "Fastow Tells Of Loss-Hiding Enron 'Raptors'". Forbes. Archived from the original on October 18, 2010. Retrieved 2010-10-17. ^ Hiltzik, Michael A. (January 31, 2002). "Enron's Web of Complex Hedges, Bets; Finances: Massive trading of derivatives may have clouded the firm's books, experts say" (Fee required). Los Angeles Times. Retrieved 2010-10-16. ^ Flood, Mary (February 14, 2006). "Spotlight falls on Enron's crash point". Houston Chronicle. Archived from the original on October 18, 2010. Retrieved 2010-10-17. ^ Healy, Paul M.; Krishna G. Palepu (Spring 2003). "The Fall of Enron" (PDF). Journal of Economic Perspectives. 17 (2): 4. doi:10.1257/089533003765888403. Archived from the original (PDF) on October 18, 2010. Retrieved 2010-10-17. ^ Dharan, Bala G.; William R. Bufkins (July 2008). "Red Flags in Enron's Reporting of Revenues and Key Financial Measures" (PDF). Social Science Research Network: 112. Archived from the original (PDF) on October 18, 2010. Retrieved 2010-10-17. ^ Healy, Paul M.; Krishna G. Palepu (Spring 2003). "The Fall of Enron" (PDF). Journal of Economic Perspectives. 17 (2): 13. doi:10.1257/089533003765888403. Archived from the original (PDF) on October 18, 2010. Retrieved 2010-10-17. ^ Kim, W. Chan; Renée Mauborgne (October 11, 1999). "New dynamics of strategy in the knowledge economy". Financial Times. Archived from the original on July 20, 2011. Retrieved 2010-10-17. ^ a b Healy, Paul M.; Krishna G. Palepu (Spring 2003). "The Fall of Enron" (PDF). Journal of Economic Perspectives. 17 (2): 15. doi:10.1257/089533003765888403. Archived from the original (PDF) on October 18, 2010. Retrieved 2010-10-17. ^ Cornford, Andrew (June 2004). "Internationally Agreed Principles For Corporate Governance And The Enron Case" (PDF). G-24 Discussion Paper Series No. 30. New York: United Nations Conference on Trade and Development: 30. Archived from the original (PDF) on October 18, 2010. Retrieved 2010-10-17. ^ Lublin, Joann S. (February 1, 2002). "Enron Audit Panel Is Scrutinized For Its Cozy Ties With the Firm". The Wall Street Journal. Archived from the original on December 14, 2012. Retrieved 2009-08-09. ^ Healy, Paul M.; Krishna G. Palepu (Spring 2003). "The Fall of Enron" (PDF). Journal of Economic Perspectives. 17 (2): 14. doi:10.1257/089533003765888403. Archived from the original (PDF) on October 18, 2010. Retrieved 2010-10-17. ^ Deakin, Simon; Suzanne J. Konzelmann (September 2003). "Learning from Enron" (PDF). ESRC Centre for Business Research. University of Cambridge (Working Paper No 274): 9. Archived from the original (PDF) on October 18, 2010. Retrieved 2010-10-17. ^ a b c d e f Berenson; Richard A. Oppel, Jr. (2001-10-28). "Once-Mighty Enron Strains Under Scrutiny". The New York Times. Archived from the original on 2010-10-18. Retrieved 2010-10-17. ^ a b McLean, Bethany (March 5, 2001). "Is Enron Overpriced?". Fortune. CNNMoney.com. Archived from the original on October 18, 2010. Retrieved 2010-10-17. ^ Kurtz, Howard (January 18, 2002). "The Enron Story That Waited To Be Told". The Washington Post. Archived from the original on October 18, 2010. Retrieved 2010-10-17. ^ Barringer, Felciity (January 28, 2002). "10 Months Ago, Questions on Enron Came and Went With Little Notice". The New York Times. Archived from the original on October 18, 2010. Retrieved 2010-10-17. ^ Pasha, Shaheen (April 10, 2006). "Skilling comes out swinging". CNNMoney.com. Archived from the original on October 18, 2010. Retrieved 2010-10-17. ^ Tolson, Mike; Katherine Feser (June 20, 2004). "Jeff Skilling's spectacular career". Houston Chronicle. Archived from the original on October 18, 2010. Retrieved 2010-10-17. ^ Niles, Sam (July 10, 2009). "In Pictures: 10 All-Time Great CEO Outbursts: Jeffrey Skilling". Forbes. Archived from the original on October 18, 2010. Retrieved 2010-10-17. ^ a b Norris, Floyd (July 13, 2001). "Enron Net Rose 40% in Quarter". The New York Times. Archived from the original on October 18, 2010. Retrieved 2010-10-17. ^ a b c Oppel, Richard A., Jr.; Alex Berenson (August 15, 2001). "Enron's Chief Executive Quits After Only 6 Months in Job". The New York Times. Archived from the original on October 18, 2010. Retrieved 2010-10-17. ^ a b Krugman, Paul (August 17, 2001). "Enron Goes Overboard". The New York Times. Archived from the original on October 18, 2010. Retrieved 2010-10-17. ^ Lay, Ken (August 22, 2001). "Defending Free Markets". The New York Times. Archived from the original on October 18, 2010. Retrieved 2010-10-17. ^ Foley, Stephen (March 16, 2006). "Enron whistleblower tells court of Lay lies". The Independent. Retrieved 2010-10-17. ^ Zellner, Wendy; Stephanie Forest Anderson; Laura Cohn (January 28, 2002). "A Hero—and a Smoking-Gun Letter". BusinessWeek. Archived from the original on October 18, 2010. Retrieved 2010-10-17. ^ Duffy, Michael (January 19, 2002). "By the Sign of the Crooked E". Time. Archived from the original on October 18, 2010. Retrieved 2010-10-17. ^ a b c d Berenson, Alex (2001-09-09). "A self-inflicted wound aggravates angst over Enron". The New York Times. Archived from the original on 2010-10-18. Retrieved 2010-10-17. ^ a b c Oppel, Richard A., Jr. (August 29, 2001). "Two are promoted as Enron seeks executive stability". The New York Times. Archived from the original on October 18, 2010. Retrieved 2010-10-17. ^ Sorkin, Andrew Ross (October 6, 2001). "Enron Reaches a Deal to Sell Oregon Utility for $1.9 Billion". The New York Times. Archived from the original on October 18, 2010. Retrieved 2010-10-17. ^ a b c d Gilpin, Kenneth N. (October 17, 2001). "Enron Reports $1 Billion In Charges And a Loss". The New York Times. Archived from the original on October 18, 2010. Retrieved 2010-10-17. ^ Norris, Floyd (October 24, 2001). "Enron Tries To Dismiss Finance Doubts". The New York Times. Archived from the original on October 18, 2010. Retrieved 2010-10-17. ^ a b c Norris, Floyd (October 23, 2001). "Where Did The Value Go At Enron?". The New York Times. Archived from the original on October 18, 2010. Retrieved 2010-10-17. ^ a b c Norris, Floyd (October 25, 2001). "Enron Ousts Finance Chief As S.E.C. Looks at Dealings". The New York Times. Archived from the original on October 18, 2010. Retrieved 2010-10-17. ^ Norris, Floyd (October 27, 2001). "Enron Taps All Its Credit Lines To Buy Back $3.3 Billion of Debt". The New York Times. Archived from the original on March 22, 2012. Retrieved 2010-10-17. ^ Norris, Floyd (October 28, 2001). "Plumbing Mystery Of Deals By Enron". The New York Times. Archived from the original on October 18, 2010. Retrieved 2010-10-17. ^ Oppel, Richard A., Jr. (October 29, 2001). "Enron Seeks Additional Financing". The New York Times. Archived from the original on October 18, 2010. Retrieved 2010-10-17. 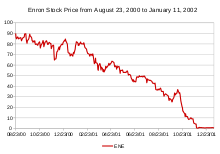 ^ "Enron Credit Rating Is Cut, And Its Share Price Suffers". The New York Times. October 30, 2001. Archived from the original on October 18, 2010. Retrieved 2010-10-17. ^ Berenson, Alex (November 1, 2001). "S.E.C. Opens Investigation Into Enron". The New York Times. Archived from the original on October 18, 2010. Retrieved 2010-10-17. ^ "The Rise and Fall of Enron" (PDF). The New York Times. November 1, 2001. Archived from the original on October 18, 2010. Retrieved 2010-10-17. ^ Oppel, Richard A., Jr. (November 2, 2001). "Enron's Shares Fall and Debt Rating Is Cut". The New York Times. Archived from the original on October 18, 2010. Retrieved 2010-10-17. ^ Oppel, Richard A., Jr.; Andrew Ross Sorkin (November 7, 2001). "Enron Looks for Investors, But Finds Them Skittish". The New York Times. Archived from the original on October 18, 2010. Retrieved 2010-10-17. ^ a b Oppel, Richard A., Jr.; Andrew Ross Sorkin (November 8, 2001). "Dynegy Is Said to Be Near to Acquiring Enron for $8 Billion". The New York Times. Archived from the original on October 18, 2010. Retrieved 2010-10-17. ^ a b Berenson, Alex; Andrew Ross Sorkin (November 10, 2001). "Rival to Buy Enron, Top Energy Trader, After Financial Fall". The New York Times. Archived from the original on March 22, 2012. Retrieved 2010-10-17. ^ Norris, Floyd (November 9, 2001). "Does Enron Trust Its New Numbers? It Doesn't Act Like It". The New York Times. Archived from the original on October 18, 2010. Retrieved 2010-10-17. ^ a b Oppel, Richard A., Jr.; Andrew Ross Sorkin (November 9, 2001). "Enron Admits to Overstating Profits by About $600 Million". The New York Times. Archived from the original on October 18, 2010. Retrieved 2010-10-17. ^ a b c d Berenson, Alex; Richard A. Oppel, Jr. (November 12, 2001). "Dynegy's Rushed Gamble on Enron Carries Some Big Risks". The New York Times. Archived from the original on October 18, 2010. Retrieved 2010-10-17. ^ a b c Berenson, Alex (November 13, 2001). "Suitor for Enron Receives Approval From Wall St". The New York Times. Archived from the original on October 18, 2010. Retrieved 2010-10-17. ^ a b Norris, Floyd (November 13, 2001). "Gas Pipeline Is Prominent as Dynegy Seeks Enron". The New York Times. Archived from the original on October 18, 2010. Retrieved 2010-10-17. ^ Oppel, Richard A., Jr.; Floyd Norris (November 14, 2001). "Enron Chief Will Give Up Severance". The New York Times. Archived from the original on October 18, 2010. Retrieved 2010-10-17. ^ Oppel, Richard A., Jr. (November 22, 2001). "Employees' Retirement Plan Is a Victim as Enron Tumbles". The New York Times. Archived from the original on October 18, 2010. Retrieved 2010-10-17. ^ Norris, Floyd (November 16, 2001). "Did Ken Lay Understand What Was Happening at Enron?". The New York Times. Archived from the original on October 18, 2010. Retrieved 2010-10-17. ^ Oppel, Richard A., Jr. (November 15, 2001). "Enron Will Sell Some Assets In Hope of Raising Billions". The New York Times. Retrieved 2010-10-17. ^ a b Oppel, Richard A., Jr.; Floyd Norris (November 20, 2001). "In New Filing, Enron Reports Debt Squeeze". The New York Times. Archived from the original on October 18, 2010. Retrieved 2010-10-17. ^ Oppel, Richard A., Jr. (November 21, 2001). "Enron's Growing Financial Crisis Raises Doubts About Merger Deal". The New York Times. Archived from the original on October 18, 2010. Retrieved 2010-10-17. ^ Sorkin, Andrew Ross; Riva D. Atlas (November 22, 2001). "Circling the Wagons Around Enron; Risks Too Great To Let Trader Just Die". The New York Times. Archived from the original on October 18, 2010. Retrieved 2010-10-17. ^ Norris, Floyd (November 23, 2001). "From Sunbeam to Enron, Andersen's Reputation Suffers". The New York Times. Archived from the original on October 18, 2010. Retrieved 2010-10-17. ^ a b Oppel, Richard A., Jr. (November 28, 2001). "Trying to Restore Confidence in Enron to Salvage a Merger". The New York Times. Archived from the original on October 18, 2010. Retrieved 2010-10-17. ^ "An Implosion on Wall Street". The New York Times. November 29, 2001. Archived from the original on October 18, 2010. Retrieved 2010-10-17. ^ "Investors Pull Back as Enron Drags Down Key Indexes". The New York Times. Reuters. November 29, 2001. Archived from the original on October 18, 2010. Retrieved 2010-10-17. ^ Henriques, Diana B. (November 29, 2001). "Market That Deals in Risks Faces a Novel One". The New York Times. Archived from the original on October 18, 2010. Retrieved 2010-10-17. ^ Glater, Jonathan D. (November 29, 2001). "A Bankruptcy Filing Might Be the Best Remaining Choice". The New York Times. Archived from the original on October 18, 2010. Retrieved 2010-10-17. ^ a b Pasha, Shaheen; Jessica Seid (May 25, 2006). "Lay and Skilling's Day of Reckoning". CNNMoney.com. Archived from the original on October 18, 2010. Retrieved 2010-10-17. ^ Ayala, Astrid; Giancarlo Ibárgüen, Snr (March 2006). "A Market Proposal for Auditing the Financial Statements of Public Companies" (PDF). Journal of Management of Value. Universidad Francisco Marroquín: 51. Archived from the original (PDF) on October 18, 2010. Retrieved 2010-10-17. ^ DeVogue, Ariane; Peter Dizikes; Linda Douglass (January 18, 2002). "Enron Fires Arthur Andersen". ABC News. Archived from the original on October 18, 2010. Retrieved 2010-10-17. ^ "Key Witnesses in the Enron Trial". The Wall Street Journal. Associated Press. January 27, 2006. Archived from the original (Fee required) on May 24, 2012. Retrieved 2010-10-17. ^ Said, Carolyn (July 9, 2004). 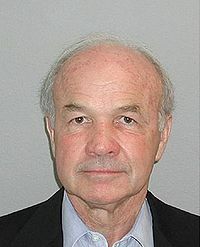 "Ex-Enron chief Ken Lay Enters Not Guilty Plea". San Francisco Chronicle. Archived from the original on January 28, 2012. Retrieved 2010-10-17. ^ Hays, Kristen (May 6, 2004). "Fastow's Wife Pleads Guilty in Enron Case". USA Today. Archived from the original on October 18, 2010. Retrieved 2010-10-17. ^ Johnson, Carrie (October 24, 2006). "Skilling Gets 24 Years for Fraud at Enron". The Washington Post. Archived from the original on October 18, 2010. Retrieved 2010-10-17. ^ "Ex-Enron Chief's Sentence is Cut by 10 Years to 14". The New York Times. Retrieved 2013-06-21. ^ Leung, Rebecca (March 14, 2005). "Enron's Ken Lay: I Was Fooled". 60 Minutes. CBS News. Archived from the original on October 18, 2010. Retrieved 2010-10-17. ^ Hays, Kristen (May 26, 2006). "Lay, Skilling Convicted in Enron Collapse". The Washington Post. Archived from the original on October 18, 2010. Retrieved 2010-10-17. ^ Eichenwald, Kurt (November 17, 2004). "Enron Inquiry Turns to Sales By Lay's Wife". The New York Times. Archived from the original on October 18, 2010. Retrieved 2010-10-17. ^ Johnson, Carrie (June 10, 2006). "A Woman Of Conviction". The Washington Post. Archived from the original on October 18, 2010. Retrieved 2010-10-17. ^ "Ex-Enron executive pleads guilty". London: guardian.co.uk. August 21, 2002. Archived from the original on October 18, 2010. Retrieved 2010-10-17. ^ Ackman, Dan (January 23, 2004). "Causey May Put GAAP On Trial". Forbes. Archived from the original on October 18, 2010. Retrieved 2010-10-17. ^ McCoy, Kevin (December 28, 2005). "Former Enron executive pleads guilty". USA Today. Archived from the original on October 18, 2010. Retrieved 2010-10-17. ^ Porretto, John (June 18, 2007). "Ex-Enron broadband head sentenced". USA Today. Archived from the original on October 18, 2010. Retrieved 2010-10-17. ^ Thomas, Cathy Booth (June 18, 2002). "Called to Account". Time. Archived from the original on October 18, 2010. Retrieved 2010-10-17. ^ Rosenwald, Michael S. (November 10, 2007). "Extreme (Executive) Makeover". The Washington Post. Archived from the original on October 18, 2010. Retrieved 2010-10-17. ^ Alexander, Delroy; Greg Burns; Robert Manor; Flynn McRoberts; and E.A. Torriero (November 1, 2002). "The Fall of Andersen". Hartford Courant. Archived from the original on October 18, 2010. Retrieved 2010-10-17. ^ "Supreme Court Overturns Arthur Andersen Conviction". Fox News. Associated Press. May 31, 2005. Archived from the original on October 18, 2010. Retrieved 2010-10-17. ^ Hays, Kristen (November 27, 2007). "Source: British bankers to plead guilty in Enron case". Houston Chronicle. Archived from the original on October 18, 2010. Retrieved 2010-10-17. ^ "Enron Witness Found Dead in Park". BBC News. July 12, 2006. Archived from the original on October 18, 2010. Retrieved 2010-10-17. ^ "NatWest Three banker's suicide in the park". Dailymail.co.uk. May 23, 2007. Retrieved 2013-09-02. ^ "Q&A: The NatWest Three". BBC News. November 29, 2007. Archived from the original on October 18, 2010. Retrieved 2010-10-17. ^ Clark, Andrew (November 28, 2007). "NatWest Three Plead Guilty to Wire Fraud". London: guardian.co.uk. Archived from the original on October 18, 2010. Retrieved 2010-10-17. ^ Murphy, Kate (February 22, 2008). "'NatWest 3' sentenced to 37 months each". The New York Times. Archived from the original on October 18, 2010. Retrieved 2010-10-17. ^ Tyler, Richard (August 15, 2010). "NatWest banker claims he was 'tortured' into pleading guilty over theft of $7.3m from RBS". Daily Telegraph. Archived from the original on October 18, 2010. Retrieved 2010-10-17. 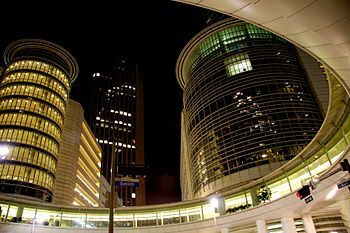 ^ "Bankrupt Enron's HQ sold for $55m". BBC News. December 3, 2003. Archived from the original on October 18, 2010. Retrieved 2010-10-17. ^ a b Axtman, Kris (June 20, 2005). "How Enron awards do, or don't, trickle down". The Christian Science Monitor. Archived from the original on October 18, 2010. Retrieved 2010-10-17. ^ "Enron's Plan Would Repay A Fraction of Dollars Owed". The New York Times. July 12, 2003. Archived from the original on October 18, 2010. Retrieved 2010-10-17. ^ Vogel, Carol (April 16, 2003). "Enron's Art to Be Auctioned Off". The New York Times. Archived from the original on October 18, 2010. Retrieved 2010-10-17. ^ "Enron's 'Tilted-E' Sign Goes for $44,000 at Auction". USA Today. Associated Press. September 25, 2002. Archived from the original on October 18, 2010. Retrieved 2010-10-17. ^ "Enron Gets Go Ahead to Sell Pipes". BBC News. September 10, 2004. Archived from the original on October 18, 2010. Retrieved 2010-10-17. ^ Doran, James (May 14, 2004). "Enron Staff win $85m". The Times. London. Archived from the original on October 18, 2010. Retrieved 2010-10-17. ^ DeBare, Ilana (September 10, 2008). "Billions to be shared by Enron shareholders". San Francisco Chronicle. Archived from the original on January 11, 2012. Retrieved 2010-10-17. ^ Davis, Trey (December 18, 2008). "UC begins distributing Enron settlement money". University of California. Archived from the original on October 18, 2010. Retrieved 2010-10-17. ^ a b c Chhaochharia, Vidhi; Yaniv Grinstein (March 2007). "Corporate Governance and Firm Value: the Impact of the 2002 Governance Rules" (PDF). Johnson School Research Paper Series No. 23-06. Johnson School of Management: 7–9. Archived from the original (PDF) on October 18, 2010. Retrieved 2010-10-17. ^ Deakin, Simon; Suzanne J. Konzelmann (September 2003). "Learning from Enron" (PDF). ESRC Centre for Business Research. University of Cambridge (Working Paper No 274): 1. Archived from the original (PDF) on October 18, 2010. Retrieved 2010-10-17.